Synopsis : Beach Wheelchair for individuals with mobility needs moves easily over sand and other beach terrain. 1: Special Needs Group is the exclusive supplier of the Joy on the Beach wheelchair in the US. 2: JoB is equipped with air-filled balloon tires that roll easily from the beach into the open water for swimming. 3: For individuals with limited mobility, water and sand can be challenges. 4: JoB wheelchair can be lowered into any swimming pool, alleviating the need for a wheelchair lift. For many, summer means fun in the water, whether it's at the beach, the pool or on a cruise. For individuals with limited mobility, water and sand can be challenges. 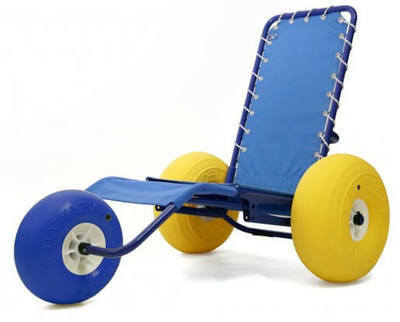 Now, a new lightweight Italian-designed beach/sand wheelchair, Joy on the Beach (JoB) from Special Needs Group (www.specialneedsatsea.com), presents an easy and enjoyable way to access the beach or pool. That was the case for Michael and Nicholas Hadler, 11-year old twins from Florida who love swimming and building sand castles at the beach. Nicholas is a physically normal young boy. Michael, however, was born with cerebral palsy and confined to a wheelchair since early childhood. Still, the twins like to romp and frolic in the water. JoB proved to be the perfect solution for this family. "As much as we all love the beach, going to the beach became less and less enjoyable as Michael got older and heavier," says the twins' mother, Luky Hadler. "We had to carry Michael through the sand and it became increasingly more difficult to transport him. I could no longer do this alone." The Joy on the Beach (JoB) wheelchair can be configured with the beach chair fully upright or laid back, and allows some users to push themselves for a short distance. The 3rd Wheel Kit (as pictured) is designed for use with the J.O.B chair and makes it even easier to push people with a disability, or the elderly, over longer distances, and provides access to beaches, swimming pools and snow covered terrain. The Hadler family let Michael try out the JoB beach wheelchair, and it was an immediate "hit," giving the twin brothers new freedom to play in and out of the water and easing the weight of responsibility for the parents. Like an "all terrain vehicle" for those with physical disabilities, JoB is equipped with air-filled balloon tires that roll easily from the beach into the open water for swimming. Additionally, with its lightweight aluminum alloy frame and protective finishes, the JoB wheelchair can be lowered into any swimming pool, alleviating the need for a wheelchair lift. According to the Hadler family, who used the chair for the first time during a July Fourth holiday weekend, the colorful, stylish JoB doesn't look a wheelchair. It is much more "cheerful." They point out it is practical as well, and with a 220-pound capacity, will accommodate Michael now and as he grows. The Hadlers look forward to increased freedom and more occasions to use the wheelchair at the beach, pool or on a cruise - or even in the snow: "We traveled on a cruise last year and this would have been great. We can't wait to use it again!" Special Needs Group is the exclusive supplier of the Joy on the Beach wheelchair in the United States. The JoB is lightweight, sturdy and suitable for both children and adults. Special Needs Group is a one-stop resource for special needs travel around the world. They offer a broad range of special needs equipment, including wheelchair, powerchair and scooter rentals with capabilities to support 500 pounds or more; oxygen rentals (liquid, cylinder, and concentrator); hearing impaired equipment; Braille printing; baby cribs; and more. *News Release by Special Needs Group, Inc.: Disabled World makes no warranties or representations in connection therewith. PR content may be edited for style, clarity, and/or length. If you are connected with this page and want it corrected/updated please contact us. Citation: Special Needs Group, Inc.. (2010/07/09). Beach Wheelchairs: The Joy on the Beach (JoB). Retrieved 2019-04-20, from https://www.disabled-world.com/assistivedevices/mobility/wheelchairs/allterrain/beach-wheelchair.php Direct Link: Beach Wheelchairs: The Joy on the Beach (JoB) - Beach Wheelchair for individuals with mobility needs moves easily over sand and other beach terrain - Special Needs Group, Inc.